PRONG Technical Services has been serving our community since 2012. We specialize in Medical Equipment Repair / Biomedical Engineering Services / Electronics Engineering Services / Information Technology Services / Quality Assurance and Readiness & Preventive Maintenance Scheduling Services. Our staff offers quality and reliable services you can count on. In addition, our friendly and professional staff is here to answer any question you may have about our company and services. 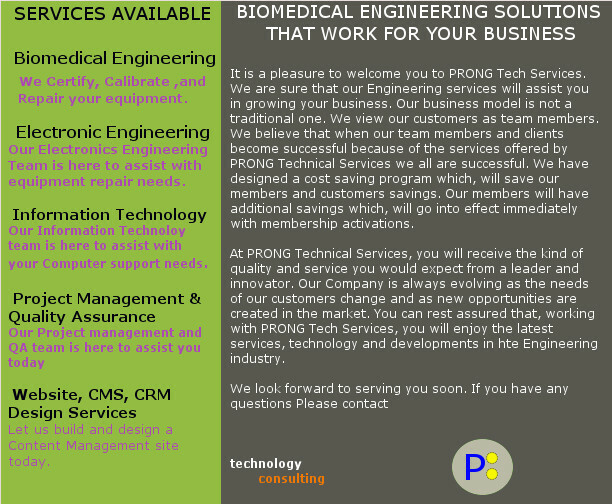 At PRONG Technical Services our Customers, Employee and Members are our greatest resource.